Remember A Long Way to a Small, Angry Planet? You can read about it here. This is the second in the Wayfarer series, and just as Small Angry Planet was a stand alone, so this one is as well. It features a minor character from Planet, and more A.I.s. I just love sentient A.I.s. Well, since Lovelace, the A.I. in the wayfarer ship was seemingly destroyed, the indomitable Pepper was called in to the ship to see what she could do to save it (her). She ended up by installing it in the body kit that the Wayfarer tech has secretly bought. She took the now ‘She’ in a body back to Port Corelis where Lovelace choose her own name, Sidra, which means ‘of the stars’. Of course. Fresh in her new synthetic body, which she continually refers to as her ‘kit,’ Sidra struggles with adapting to a view that is cone-shaped and narrow, and the overwhelming incoming stimuli. She lives with Pepper and Blue, Pepper’s friend and partner. The narrative then jumps into the story of Jane 23, a young female who works first cleaning then repairing parts with her clone-sisters on a distant planet. Yeah, Jane 23 is Pepper as a young girl. Chapters go back and forth between the two, but are occasionally interrupted by a type of underground message boards where less-than-law-abiding citizens talk shop. Thematic parallels give us the title to the book. I found myself both eager and reluctant at the end of each chapter to resume the other story. In a way, both are stories of survival and of identity, and they dovetail beautifully. Jane 23 escapes her factory, and comes upon a damaged starship in the midst of the junkyard surrounding her factory. She enters and the AI which is still functioning, tells Jane of the two crew who died and left her alone in the ship for ten years. Jane with the help of the AI, who calls herself Owl, find food, and after a number of years, Jane begins to build a viable spaceship out of junk in order to get them off that planet. She meets another clone, a boy, and takes him with her back to the ship. Eventually she is successful with her build, and off they go, to be finally rescued by a roving spaceship, and delivered to Port Corelis, where she and the boy (yep, you guessed it — now Blue) now live and work. Pepper has one overriding desire — to find her spaceship and retrieve Owl, who hopefully is still in existence. The rest of the book is about their venture to recover Owl when someone on that message board locates the ship in a museum. I liked Small Angry Planet very much, but loved this one. Maybe because the sapient A.I. was featured. I am all about robots. 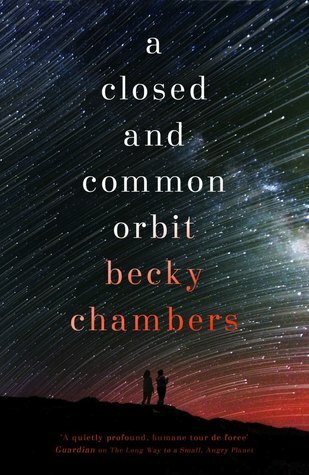 A Closed and Common Orbit was a Hugo Award Nominee for Best Novel (2017), Arthur C. Clarke Award Nominee (2017), and Goodreads Choice Award Nominee for Science Fiction (2016). You might call it Cozy Sci Fi. Yeah, I would definitely call it Cozy Sci Fi. This entry was posted in Fiction, Hard Science, Sci Fi.